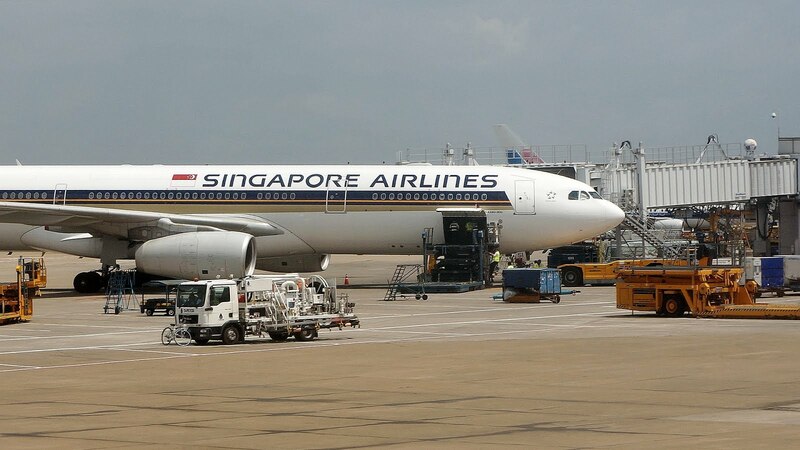 Singapore was our gateway to Asia and also our departure, something commonto many families like ours, as this is one of the busiest airports in the world and is also considered one of the best airports in the world, which also did not stop being our opinion when we passed. If on arrival our departure was quick and efficient (you can see here how to get out of Changi airport to the center of Singapore), with a quick exit from the airport towards the city, on our return to Europe we did a stopover of several hours at the airport, so we did a previous study of what we could do in the family to make these hours as pleasant as possible, as well as to know the best of one of the best and most famous airports in the world. And, we can assure you, this is one of the most family friendly airports in the world. This is a wonderful airport and one of the offers is even a must see. 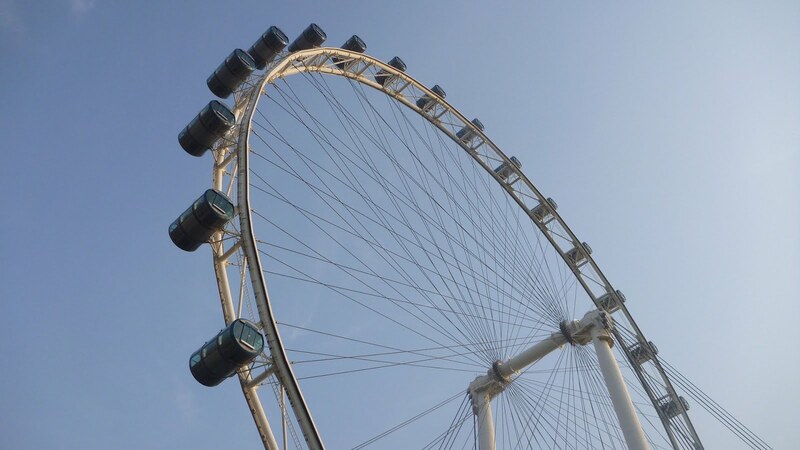 We did not use it because we were staying in Singapore two days early in our trip but if you are just passing through the airport and the waiting time for your flight is more than 5:30 am you can hold a Free Singapore Tour. This is a fantastic and free option to get to know a bit of a fantastic city and make the most of the waiting hours for your plane. 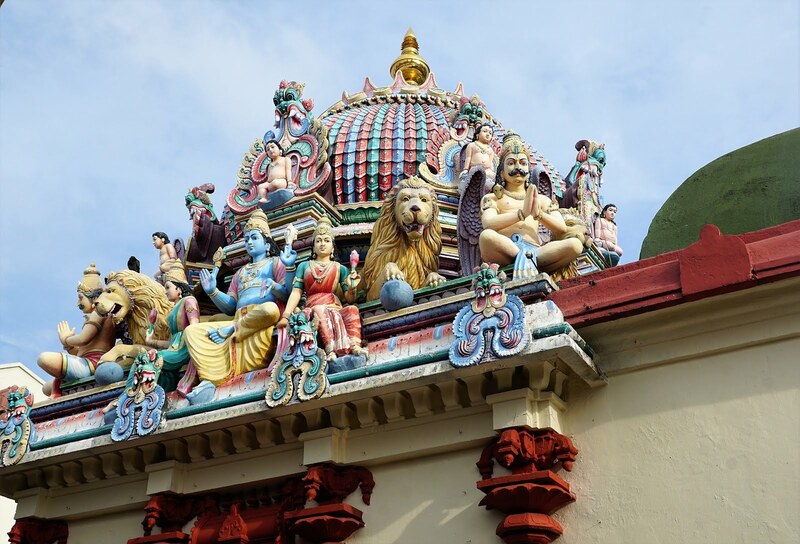 There are two tour options, the Heritage Tour, with daytime departures that will take you to the city's historic districts such as Chinatown, Litle India and Kampong Glam. 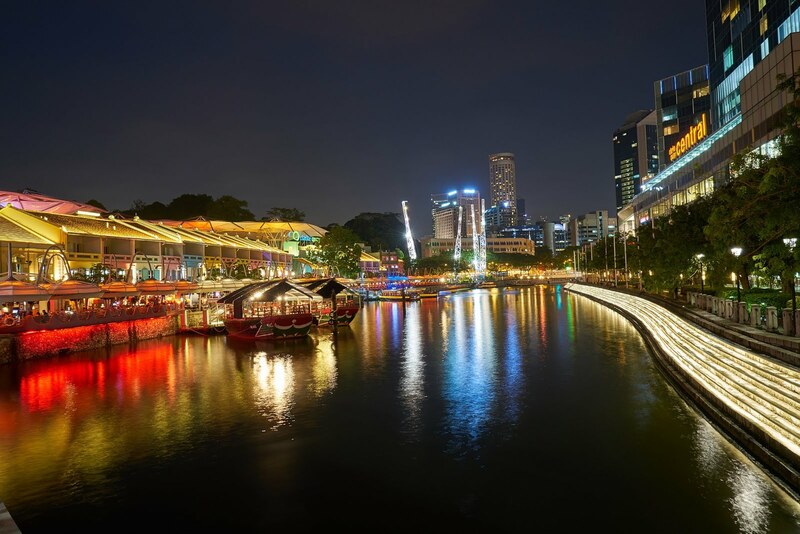 The other option of Tour is the City Sights Tour, which takes you to know the modern Singapore more at the end of the day and to see the magnificent colors of the city as the day gives place to the night. To be able to do these tours, you must make a previous registration (it is easy to find the place to do it, because there are several signs to indicate) until one hour before the departure of the bus, in Terminal 2 and 3. You can not go through immigration to be able perform this tour. For more information on up-to-date schedules and how to register, see the website here. And how about enjoying Singapore's heat to be in the pool? This is not a free possibility, the cost is SD $ 17 per person but you can use the swimming pool, the Jacuzzi and the bathing facilities from 6am until 00h. The pool is on level 3 of Terminal 1, overlooking Aerotal Airport and, if you are a guest of the hotel you will not have to pay for the use of the pool. And if we tell you that, also at Changi airport, can you visit a Cactus garden? Well, it is possible. Also in Terminal 1, Level 3, and free access, you can see a collection with more than 100 catos, with origins scattered throughout the different corners of the world, such as Africa, Asia, America. This garden on the roof is also served by a bar, which allows you to unwind and have a cool drink while you wait for your flight. This is, for us, one of the main attractions of Singapore airport. This fantastic airport is equipped with two movie theaters which, functionally free for 24 hours a day and allows you to watch free movies for recent ages for different age groups. Without doubt a great way to spend your time, which you can take advantage of either Terminal 2 and Terminal 3. We advise you to see in advance the schedule of the two rooms on the official website of the airport (see here), and make the choice of your preference. The company may close a few hours during the week for maintenance, so we also advise you to consult the site to see the time when this happens. 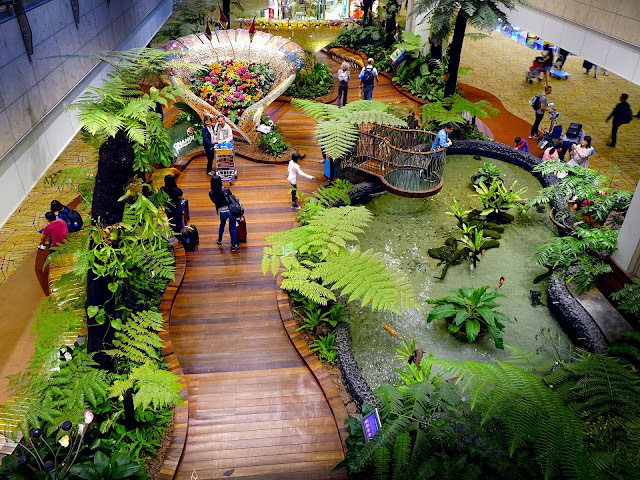 Something we can not recommend is a tour of the Enchanted Garden of Singapore's Terminal 2. 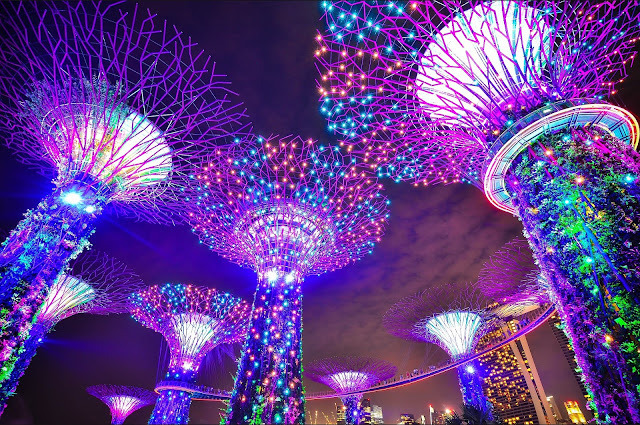 This garden will not fail to marvel your children as well as adults as they pass by and the flowers made with glass mosaics come to life through the colorful LEDs that light your way. To visit this magnificent combination of nature and technology. 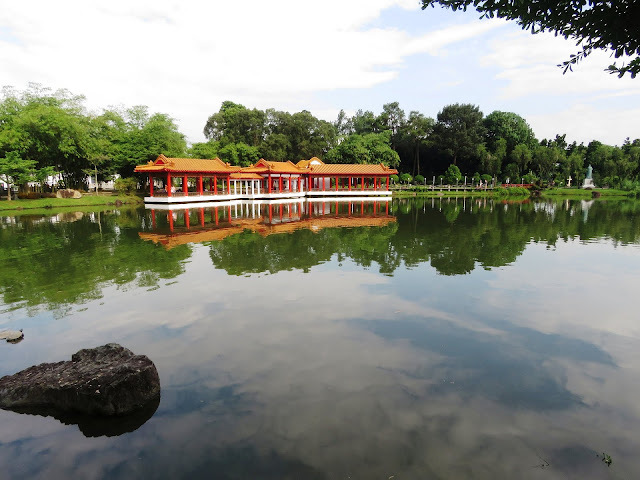 This is a beautiful garden, located at Level 2, with about 700 orchids of diverse colors of more than 30 species and with a small artificial lake with carp. In the middle of one of the busiest airports in the world, it is phenomenal to find a space with such tranquility. 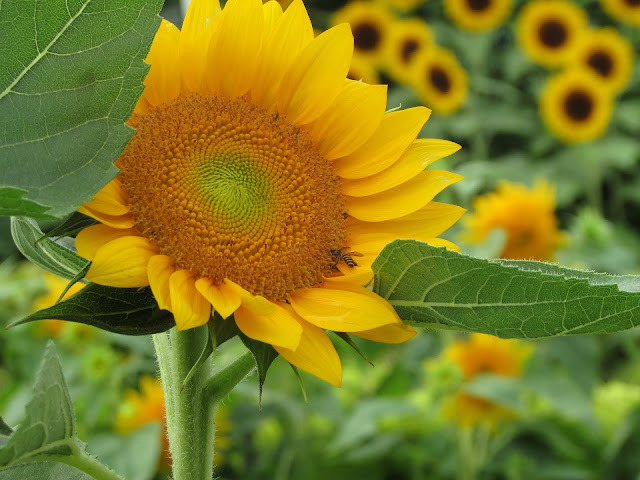 And, since we are talking about Jardins, also in this terminal and, in Level 3, next to the cinema you can enjoy the Sunflower Garden. This garden is outdoors and has more than 500 sunflowers, of various species. It also has the special incentive to enable a special view for the landing and take-off of airplanes. This is a great place for children of different ages and ideal for rest while your children entertain themselves. Very nicely decorated and, with the TV constantly playing children's programs, could be a great option to spend time. To access the Family Zone, you will have to climb the stairs and it is on the opposite side of the Playground. If what you want is not to play but watch sports, you can do it in the Xperience Zone, where they are broadcast on big sports screens from all over the world. It's located on Level 2. And what about riding the biggest slide in the world inside an airport? There are two versions of this slide, one for the youngest with more than 1.1 in height, in which it can descend once free of charge and the larger version, for which it must be more than 1.3 meters high. This second is no longer free, but for every ten euros you spend at Changi airport, you are entitled to one ticket. Please note that the Slide is not working all day, so we advise you to consult the airport website to be more certain of the hours of operation and how to access. In this special airport neither a garden of butterflies is missing! It is in Terminal 3 that you will find the famous Butterfly Garden of Changi Airport. 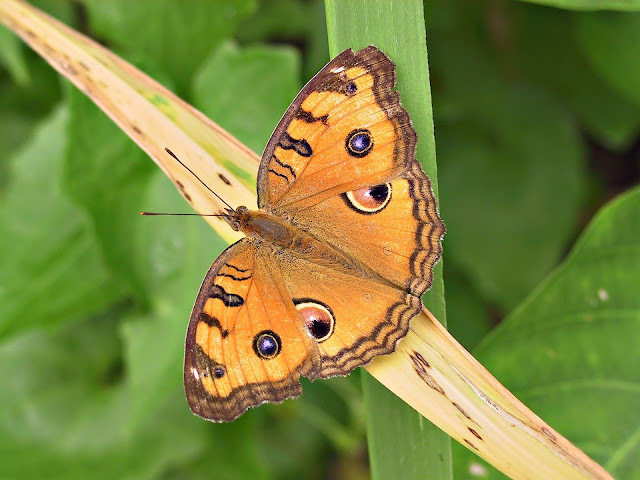 It has more than 1000 butterflies of about 40 species. It is a visit that does not take much time to accomplish. To visit this butterfly, you must have your boarding pass and we promise that it is very worthwhile during the day, because at night the butterflies are sleeping and the beauty is smaller. Let's go to the movies? Close to the Butterfly Garden is the Movie Theater. As in Terminal 2, this terminal also has a free movie theater. See the schedule here. Terminal 4 is the newest and most modern terminal at Changi Airport, and for those who travel with family, the main attraction is the Heritage Zone, designed to convey to the traveler what was former Singapore. Here you can learn a little more about Singapore's past, before it has transformed into this modern metropolis, and learn more about its culture. 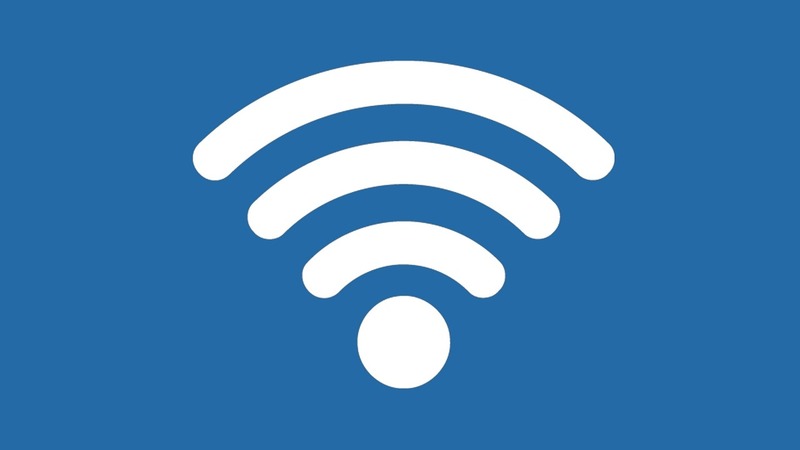 Since 2002, before it has become more common, Changi Airport offers its passengers free Wi-Fi. You will also find over 550 Internet Stations available to the airport logo, so it will be easy to stay connected to those you love. At the 4 terminals of the airport you will find Play Areas, well located and easy to find through the signs along the airport. These areas are aimed at children from 1 to 12 years and only a great option for the game during a few hours of waiting. And how about your son take home his high work? Through the 4 terminals you will find a block of wood, with crayons and flas that will allow the child to realize artistic creations inspired by the local popular culture. If rest is what you really want, look for one of the rest areas distributed by the different terminals of the airport and, relax and unwind. You will feel how much this airport likes to pamper you. 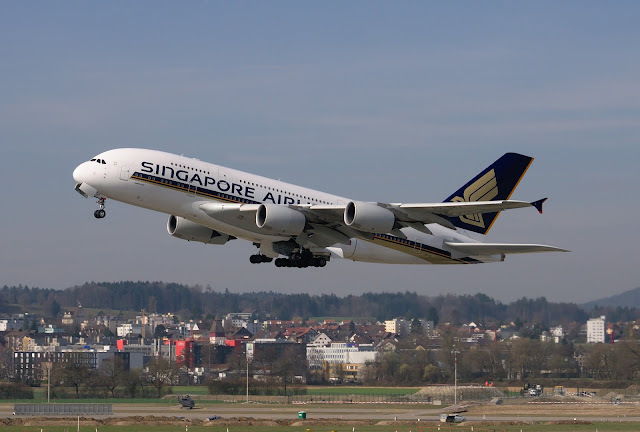 But what if you want to do something to rest but to shop, you know that Changi Airport is also known as one of the best places to shop and the offer is huge! Check here the official website of the airport to see the offer of shops. Of course, staying at the airport for several hours requires you to think about where to eat, and this is an issue where the airport will not leave you behind. You can check here to see different options for choosing different terminals but if you can, we recommend that you go to T3 and enjoy the Singapore Food Street. 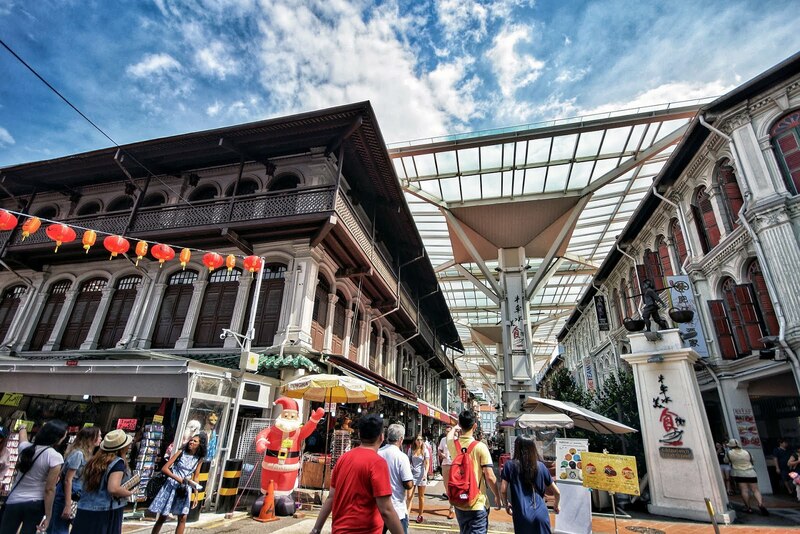 This is a street designed to resemble an old street in Singapore and with a wide gastronomic offer that will surely leave you with a great experience before your departure from Singapore. It is located in Basement, level 2 of Terminal 3 and is very easy to find. Look for escalator or lift 65. Although it is off the passenger boarding point, it is possible to go there as long as you have your boarding pass to the next flight. 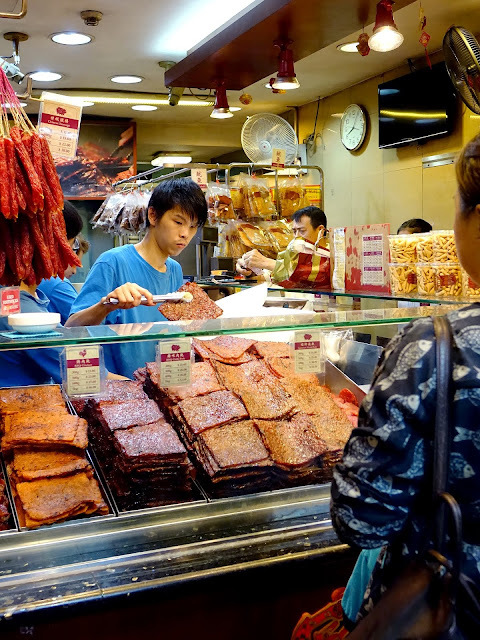 It has about 20 stalls, with prices very similar to those found in the city. So what if we told you that the best place to eat at Changi airport is in the staff canteens? And, for very, very affordable prices. Intended to serve the hundreds of employees operating at the airport, these canteens have a wide range of culinary offerings to satisfy the tastes of workers from various countries. For prices ranging from SD $ 2.5 to SD $ 5, you can have a delicious meal. The presentation is not the most careful, with meals served on paper plates, with plastic cutlery but with such tasty meals that it is often people who come specifically to the airport to eat there. It is also not easy to find, as it is not yet signposted, but we advise you to read this CNN article to know how to get there. 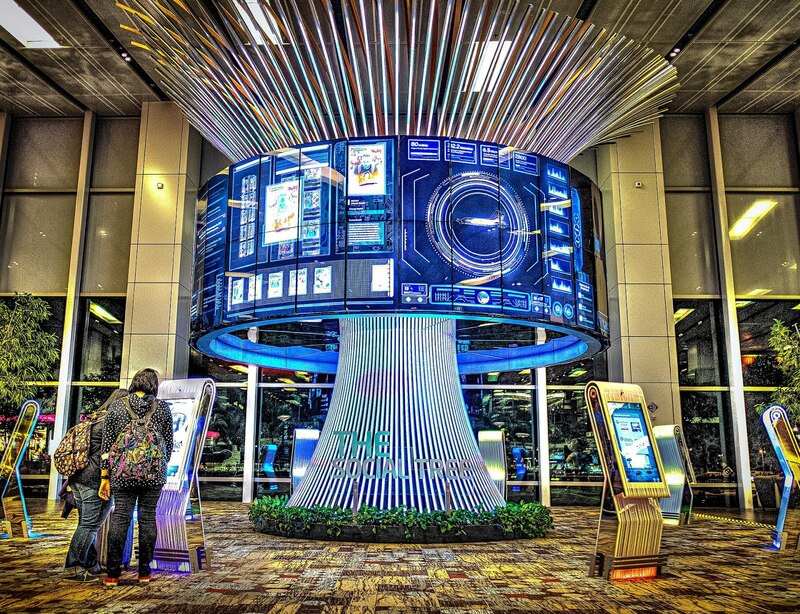 We hope this article will help you organize your time at Changi Airport in Singapore. If you want to go to the city center, you can see here how to get there and if you plan to spend a few days in the city, see here for some ideas that can help you plan your trip. The attractions of this city-state are manifold, ranging from culture, iconic buildings, museums, gastronomy, casinos, amusements for children, etc ... However, we only had two days and we had to plan and choose. So, to organize our 2 days, we decided to dedicate the first to the modern part of the city, and the second to the most ethnic and historical part, also known to be inhabited by three populations with different origins and customs, namely Malay, Chinese and Indian. This is the main shopping street in the city and there are those who say that it is the best and most famous in all of Asia. The main reason we chose to start our day here is not because we are fanatics about shopping, it was because we preferred to end the day more by the sea, and so we start the program on this street. Even if you are not a shopping fanatic and this is not your main destination, we must say that this is a street worthy of a visit. Its just over 2 km from glamorous and futuristic buildings, that sometimes intersect with more traditional streets, shops, restaurants, hotels. Full of movement, we recommend to visit even if only to see. Then we went to the Merlion Park, which can be done by public transport or on foot, a walk of about 1.5 kms from the end of Orchard Street facing south. Merlion Park is where Singapore's symbolic Lion, the Merlion, sits on the other side of the bay overlooking Marina Sands Bay. 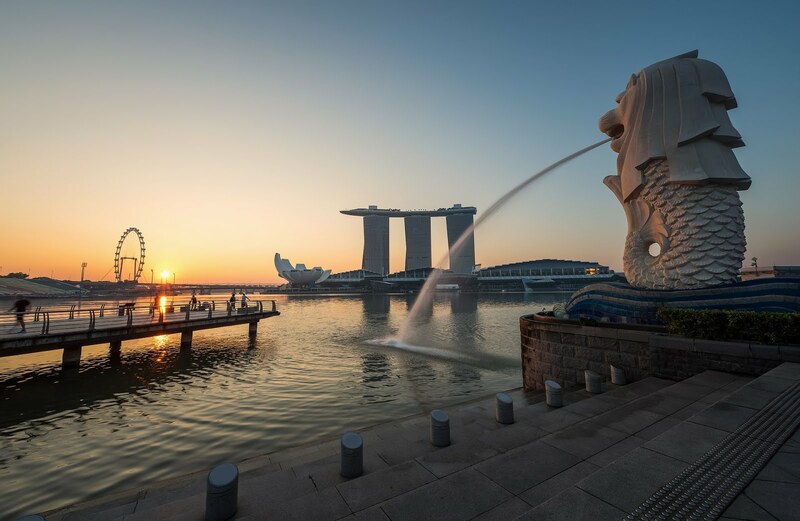 Merlion is the statue of a lion with fish body that pours water into the beautiful Marina Bay. 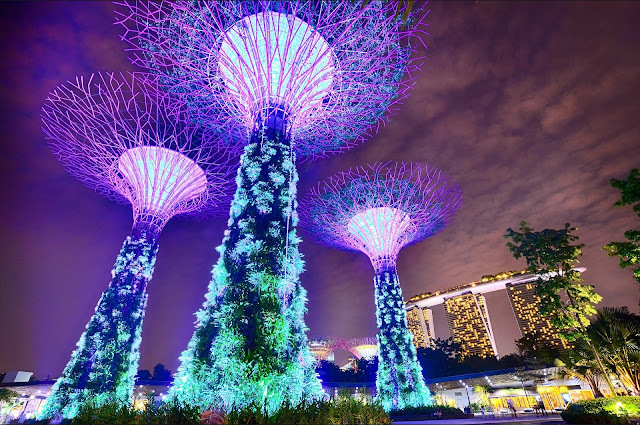 It's a must-see when traveling to Singapore, a perfect place to take pictures and to continue your journey to the next destination. It has a wonderful esplanade and restaurants and cafes in the area. 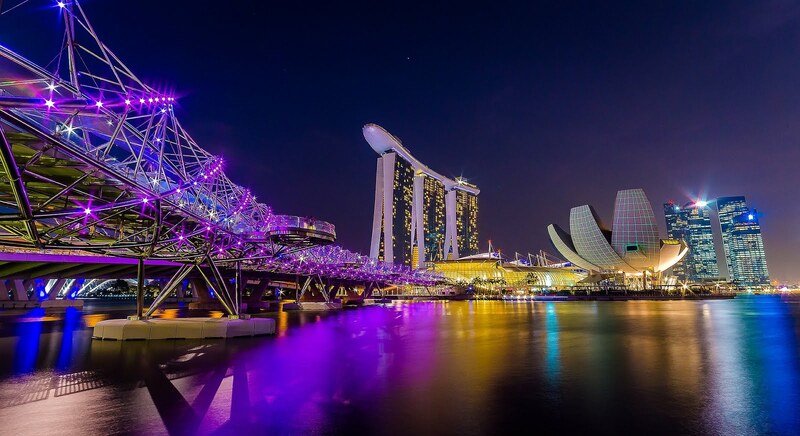 This is also a good location to see the Spectra, a spectacular light show that takes place daily in the waters of Marina Bay, and is free. For more information about schedules, see here. This is one of the biggest giant wheels in the world and the view from its top is phenomenal. However, the prices charged are high (you can check here), so we just observed from outside. 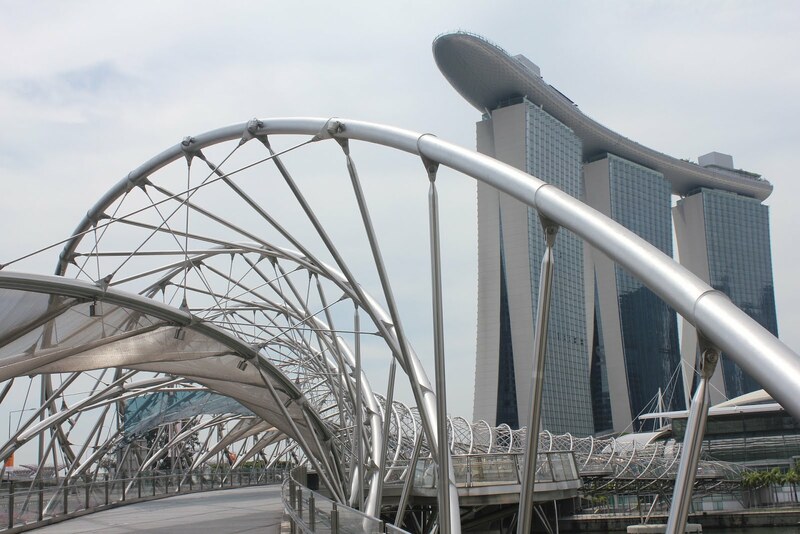 This pedestrian bridge is right near the Singapore Flyer and, with free access, is something you can not miss on your visit. Inaugurated in 2010, it is a masterpiece of engineering, based on the DNA chain, which we loved to pass. Then we passed the ArtScience Museum. 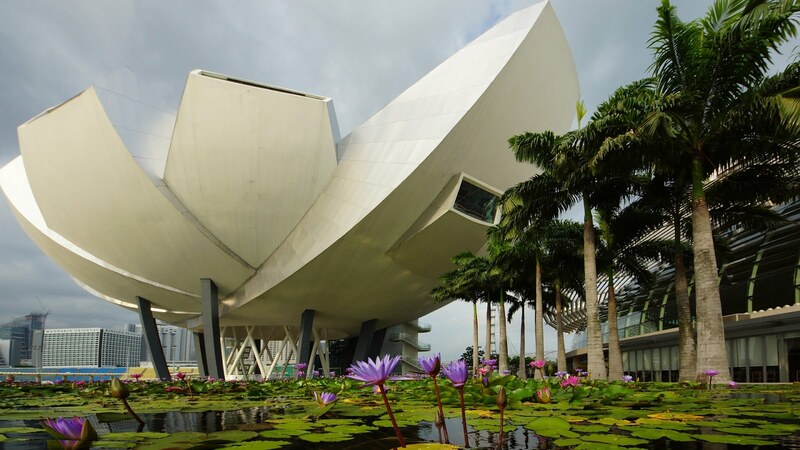 This museum, situated on Marina Bay is another of the architectural marvels one can find in Singapore. Designed to remember a lotus flower, it was inaugurated in 2011 and has since been one of the images of the city. To know more about the entry prices, temporary exhibitions and schedules, check here. This dream hotel has the world's most well-known infinity pool, located throughout its three towers, whose photographs span the globe. Unfortunately access to the pool is only available to those staying at the hotel and for a large percentage of those visiting Singapore this is a cost that is very out of budget. However, it is possible to climb to the top of this building, to its Observation Deck, and enjoy the wonderful view. We recommend this visit near the end of the day, when the lights start to light up around the city and the scenery is stunning. However, remember that this observation post is on the opposite side of the pool, you will not be able to see it. You can access more information about the visit, prices and schedules here. Then we went to Gardens by the Bay, where are the futuristic trees that are also one of Singapore's brand images. This is an impossible spectacle to fail to anyone visiting Singapore. The walk through the garden is free but entrance to the pavilions is payable. You can access more information about prices and times here. There may be slight changes in time, so please verify the exact time here. 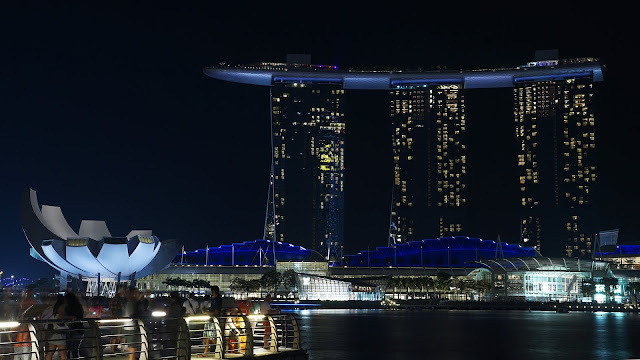 Shortly afterwards, we recommend that you head for the Spectra, the water, lasers, fire and light show taking place at Marina Bay, just in front of the Marina Bay Sands Hotel. It's also free but you should get there early to get a good spot. You can access more information about the show here. This is undoubtedly a great way to end the day. Our second day in Singapore was dedicated to the oldest and most historic part of the city. You can see the full map on google maps here. 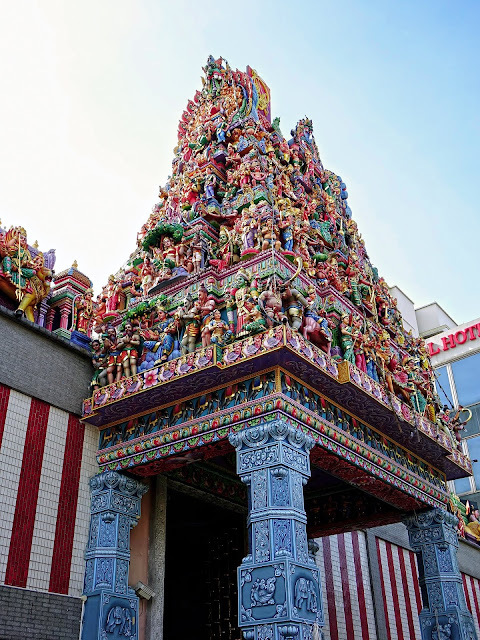 Our first stop was to visit the Sri Veeramakaliamman Temple, which is situated on the main avenue of Little India, the Serangoon Road. Its exterior is impressive and, for those who, like us, had never entered an Indu time, we were fascinated. 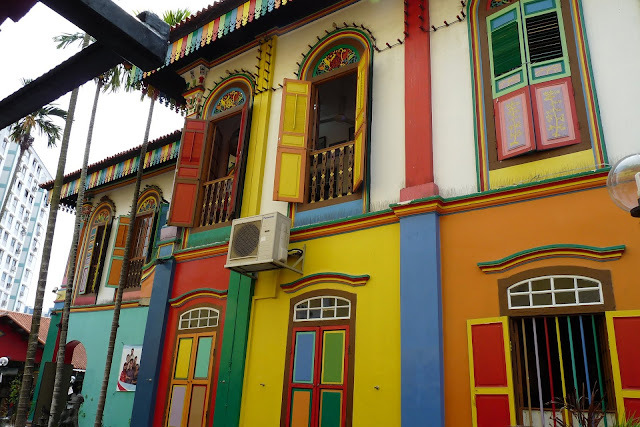 Then we walked the streets toward Bugis Street, our next destination, past the exterior of the Indian Heritage Center. You can see here the official website for more information. This is the best known marketplace in Singapore for the lowest prices where you can find the largest bargain deals. 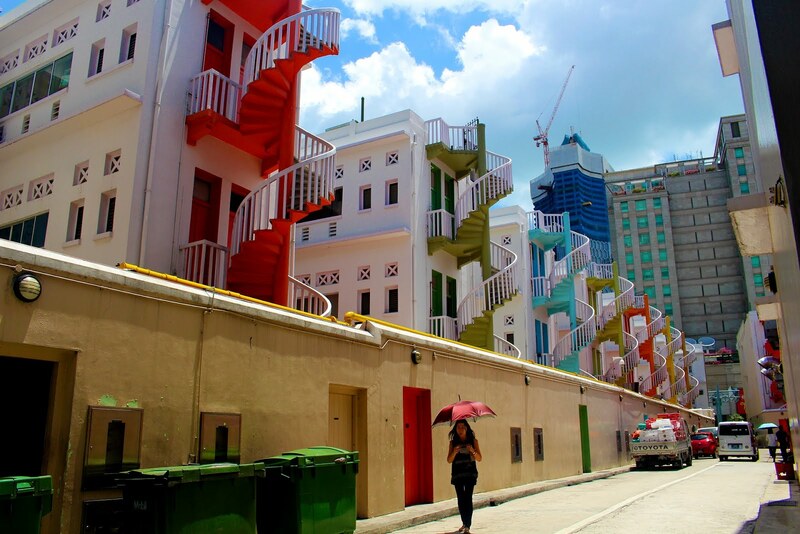 It's a good stroll, ideal for shopping for souvenirs from Singapore, eating, and be sure to go see the colorful spiral staircases behind the back street of Bugis Village (233 Victoria Street). Then, we went to Arab Street. This is a very well organized street, full of commerce, and is a good place to walk. The first passage was by the Sultan Mosque (also known as Masjid Sultan, one of the most traditional mosques in Singapore. It is a beautiful place, whose entrance is free and should be done through the main door for tourists and you can not have access to everything. In the building, please do not forget that it is a place of worship and, with due respect, you will have to remove your shoes at the entrance and, if your clothing is not suitable, you can ask them to loan you clothes for the visit. in a friendly and cordial way.You can find out more about timetables here. Then we passed the gardens of the Malay Heritage Center. 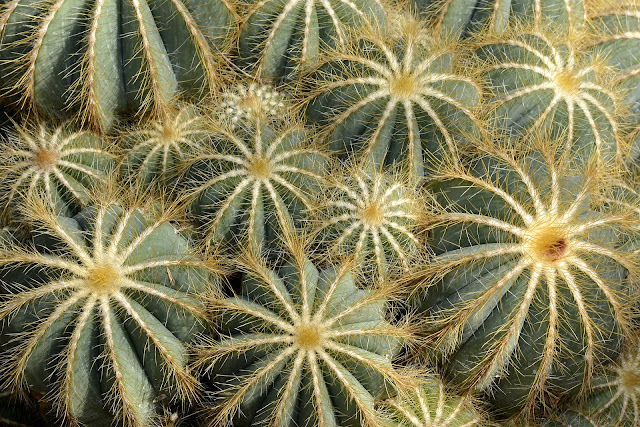 Admission is payable, so we just strolled outside and the free visit to the gardens is worth it. You can check the official website to know more information about the price and times here. This Cathedral, dating from 1832, is the oldest Roman Catholic church in Singapore and comes to mind as Singapore is able to have such a vast cultural and religious complex in a small territory. The air conditioning is good and, despite being a busy church, it is a good stopping point and reflection. We continue our way stopping by Old Hill Street Police Station. It used to be an old prison, the first one in Singapore. 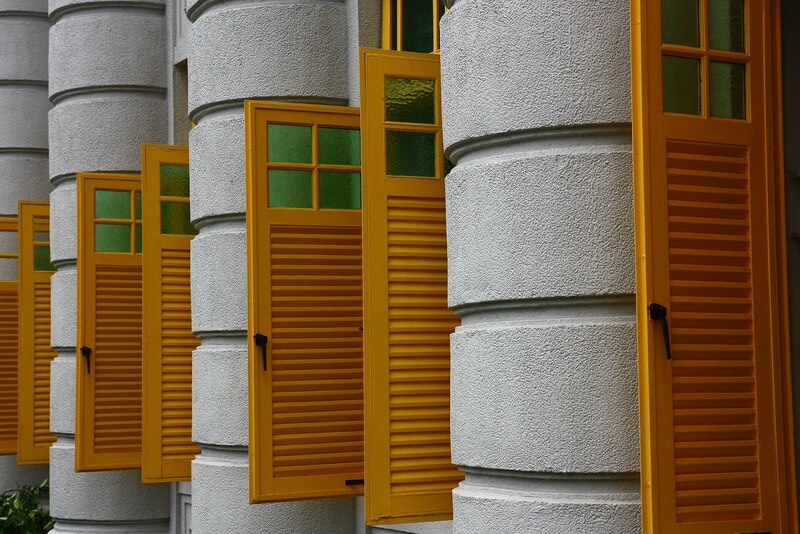 It now houses a number of public services, and its main attraction is the colorful, eye-catching windows before setting off for a relaxing stroll through Fort Canning Park. This is a park that, in the midst of the hustle and bustle, will know wonderfully well to be able to relax and to feel in the middle of the vegetation. Full of history, it's a great walk to relax before heading back out into the middle of the action. After this relaxing visit, we drove to Chinatown. On the way we passed close to Clarke Quay but this was a visit we wanted to book more towards the end of the day. Chinatown was our best experience and, in our opinion, the most interesting of Singapore's neighborhoods. Take South Bridge Road to Masjid Jamae (also known as Chulia). 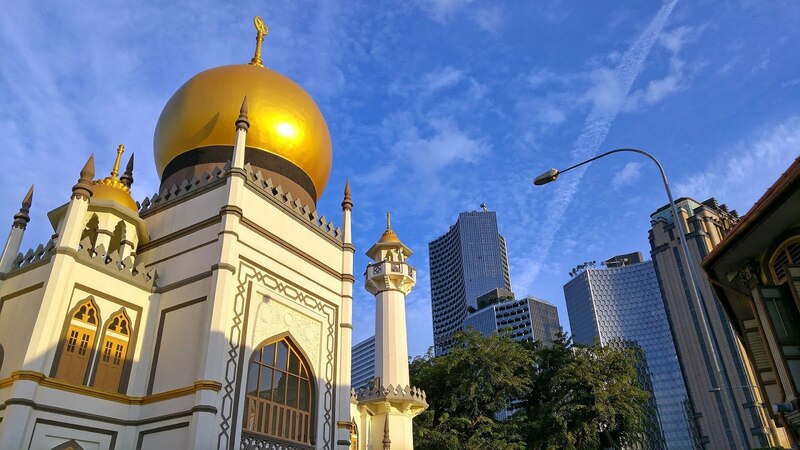 This is one of the oldest mosques in Singapore and a landmark in Chinatown. Then we went to the Thian Hock Keng Temple, a temple of 1821 which, although not very large, is very beautiful and certainly deserves a visit. 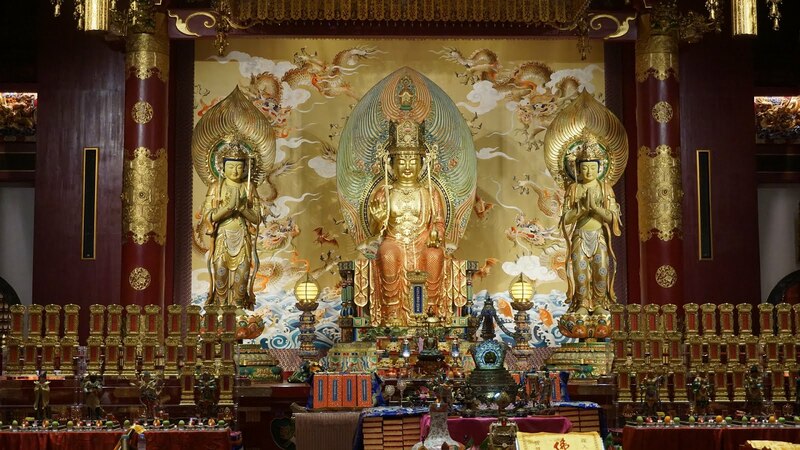 After our visit, we continue our tour through Chinatown towards the Buddha Tooth Relic Temple, where they say that a Buddha's tooth is stored. Finished this tour, we went to the Chinatown Complex Food Center looking for dinner and this is one of the best places in Singapore to eat. With a wide offer and very attractive prices, let yourself be amazed and, being in Singapore, we can not fail to recommend that you sample the Crab but be careful, it can be spicy. After dinner, and as the day was already huge, we strolled along Eu Tong Sen Street, still in Chinatown, to Clarke Quay. This is one of the perfect areas to walk to at the end of the day, with a wide offer of restaurants (much more expensive than in Chinatown), bars and shops. At the end of the day, the lights fill the area with a special color, in an area already colored by the colors of the houses and bars along the Singapore River. A great sightseeing walking tour before heading to the hotel. We hope you enjoy your trip in Singapore. 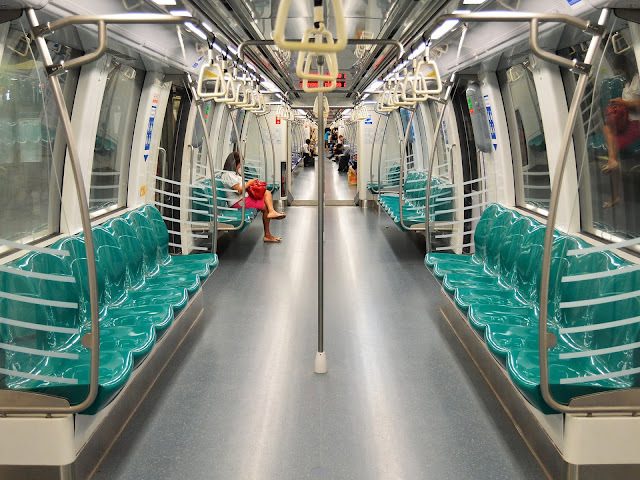 You can see how to get from Changi Airport to the city center here. How to get from Changi Airport to Singapore City Center? Changi International Airport is one of the busiest on the planet and has also been voted the best in the world. 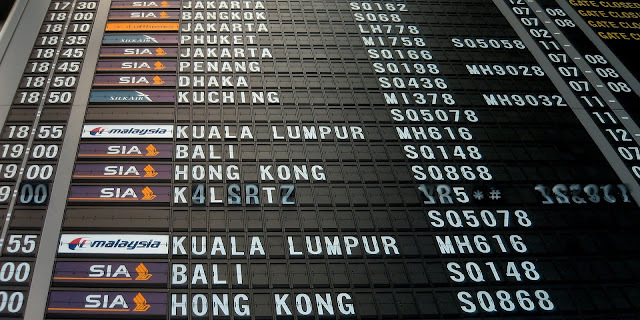 With connections to cities around the world, it is one of the main gateways for those who want to go to Asia and Australia. 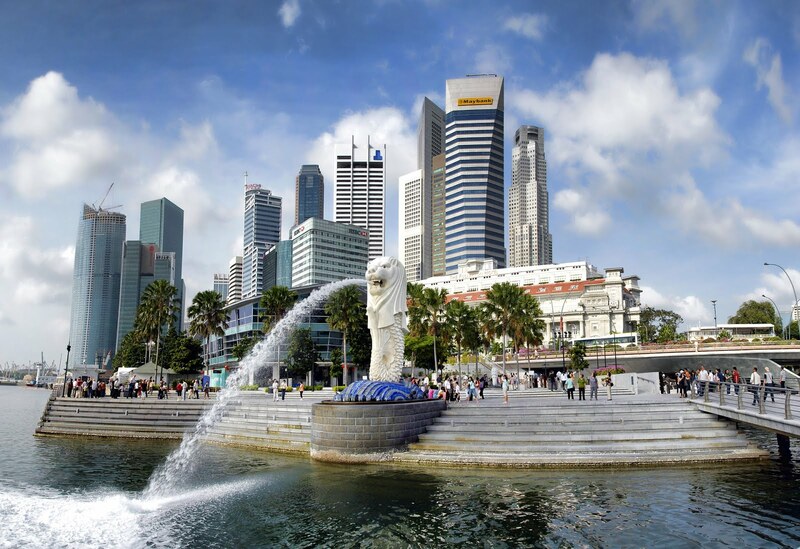 Many passengers pass through Singapore only as a place of passage to their final destination but we, in our family travel through Asia, have organized ourselves to be able to meet Singapore city-state for 2 days. After a nearly 13-hour flight from London, what any adult traveling with children wants is to get to their destination as fast as possible, so we tried to gather some information that allows us to feel less lost on arrival at the airport. 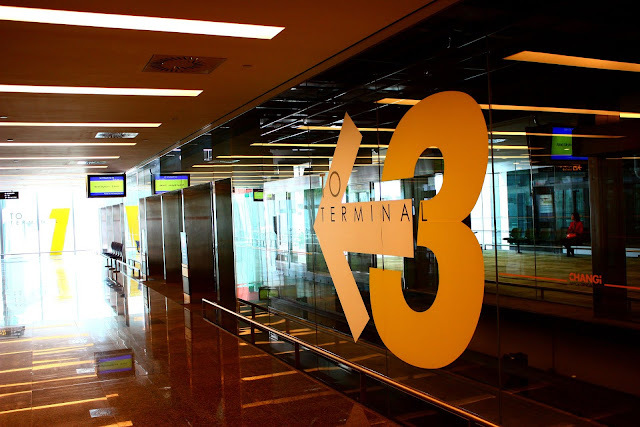 Changi Airport has 4 terminals, easily accessible via the Skytrain. This is a beautifully organized airport and we can guarantee you will not feel lost or disorganized. How to exit the airport? After landing, you should look for the Arrival indications in English, its impossible to not see it. You should follow this route to the Immigration and Passport Control area. There, you have to queue for control, and only after that, you can lift your bags, which should be done following the easily visible indications of Baggage Claim. Once you have your suitcases, follow the signs for Customs, you will also easily see the signs all the way, and after that, follow the signs for Arrival Hall. When arriving at Arrival Hall, you will have indications of 3 possible means of transport to the city center, which is located about 17 Kms from the airport: Train, Bus and Taxi. There is a fourth possibility, the City Shuttle, of which we shall speak later. Schedule: from 05:31 to 23:18 from Monday to Saturday and from 05:59 to 00:06 on Sundays and holidays (please confirm here). This was our choice. From what we have investigated, it is the option that best combines efficiency, price, and speed. If this is also your option, what you should do is follow the visible indications along the route to indicate the way to the Train and, going down the escalators that will take you there. The MRT station is located between Terminal 2 and 3 and is easy and fast to access. When you get to the floor of the train station, you have two options to get your ticket. In our case, we used a vending ticket machine, where we purchased a standard ticket for our trip to our destination. When you arrive at the vending ticket machine, you must choose the standard ticket, and then you will be asked for your destination station, which you can select by pressing on the screen of the machine. If you do not wish to use the vending ticket machines, or if you wish to purchase another type of ticket, such as rechargeable cards or Tourist Pass, go to the Ticket Office, which is easily visible next to the vending ticket machines. In our case, since we were staying in a central hotel, we opted for the standard ticket option, which cost less than 2 SGD (2018 price). Payment can be made with cash (coins or banknotes in the upper right corner of the machine) or credit card. 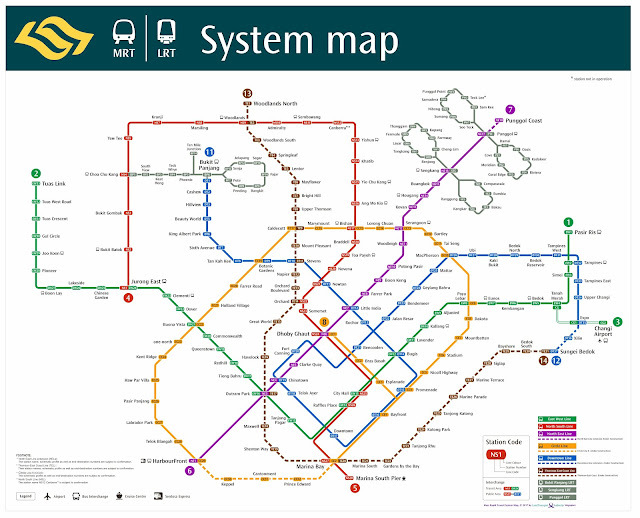 We always advise you to carry out before traveling an online consultation at the MRT station near your hotel, so that you can calculate the route and the price of your ticket. For more information about prices and different transport tickets, see here. Our final destination was the Chinatown DT19 station, so we had to make a train change. First, we caught the MRT at Changi station, East-West Line, and we went to one station to the MRT Station Expo. 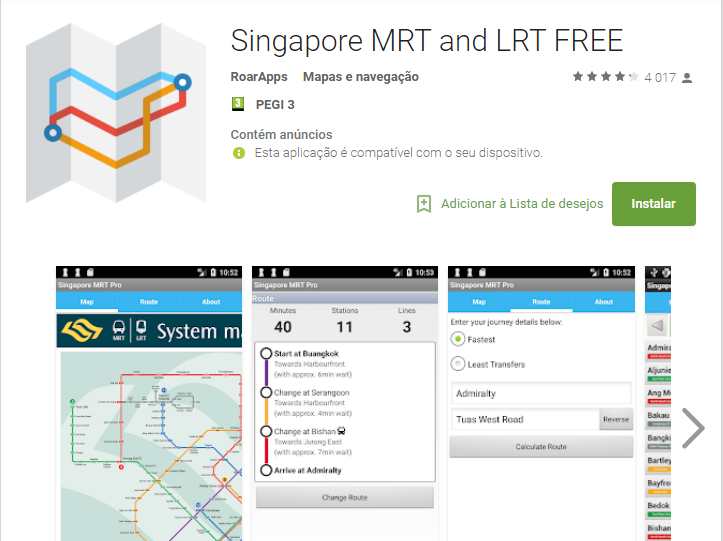 Subsequently, we took the Downtown Line and it was 16 stations up to Chinatown DT19. The total course lasted less than an hour. Something we advise is to do at home this study of the stations that will go through, check the possible train changes, and where you should perform them. This is important in the sense of not wasting precious time because you have to study the route at the time or, even worse, miss your station during your trip. That's not a good thing after an intercontinental flight. For those who, like us, travel with children, there is the possibility of not paying the child's ticket, if he is less than 0.9 meters in height and accompanied by fee-paying commuter travel. This rule applies to both the train and the bus. Do not forget that you must keep your ticket throughout the trip, as you will need to use it to leave the destination station. We also suggest you download the Singapore MRT and LRT Free application, for IOS and Android, where you can access the transport map and the best way to organize your trip. Schedule: During the week bus 36 runs from 06:08 to 22:52, Saturdays from 06:07 to 22:52 and Sundays and holidays from 06:06 to 22:53 (please confirm here). The Bus option is not much more expensive than the MRT, but because we consider it more complicated and less fast, we do not choose it. If it is your choice, when arriving at Arrivals Hall you should go to the bus area, easily reachable following the various Bus indications. 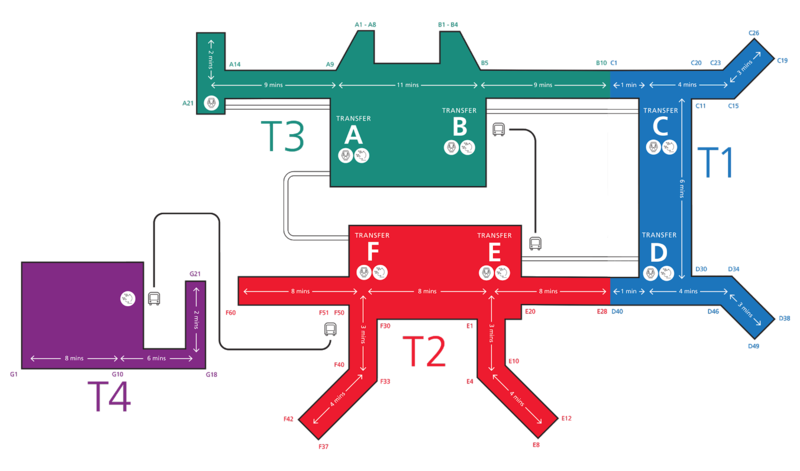 Each terminal (1, 2, 3 and 4) has its bus station, which is located downstairs from the airport. 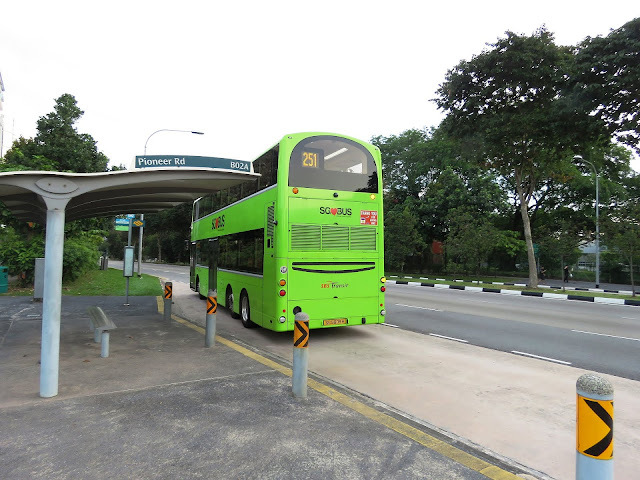 Bus 36 is the only bus line that connects directly to the airport and makes a return route between the airport and Tomlinson Road. 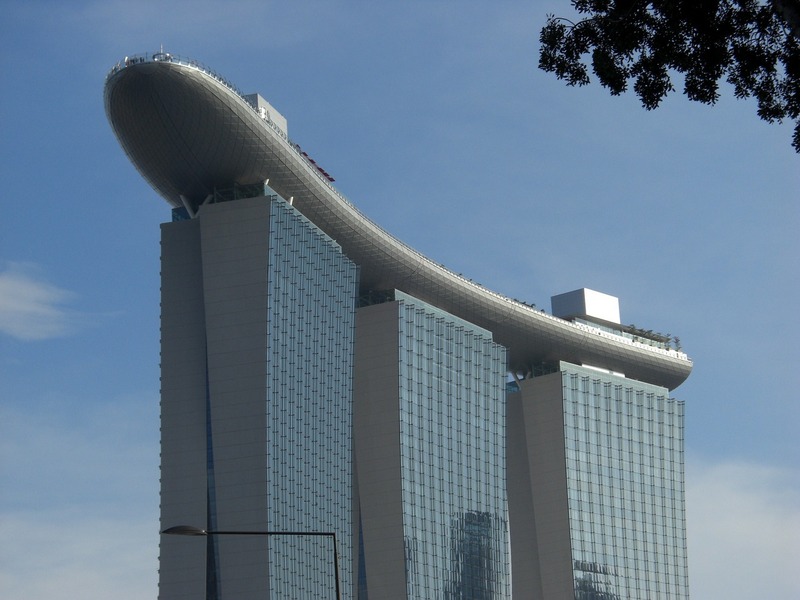 There are a few important streets in Singapore such as Marina Parade Rd, Suntec City, Somerset Rd, Orchard, but if your hotel is not on your route you may need to make the connection with another mode of transportation to its destination, which makes this possibility probably the most time consuming (see here all the itinerary). It is possible to use the EZ-Link Card to pay for your trip (see here how to purchase and use) or, If you want to use money, when you arrive at the bus you must have the exact amount to pay the ticket (in 2018, to our destination, was S$2.10), because no change will be given. And, this may not be an easy operation for those who have just arrived in the country usually have no coins to pay the exact amount of the ticket. This is probably the most comfortable and quickest way to reach your destination. It has the inconvenience of being the most expensive. Catching the taxi at Changi Airport is easy. To do this, simply follow the arrows to say TAXI that is at the exit of the different terminals and all have a place to queue, extremely well organized, even queue for priority passengers. Usually, the waiting time is very low or zero, and this is a service that runs 24 hours a day. There is a visible price estimate before you pick up your taxi which, at 2018 prices, range from $ 23 to $ 40, depending on the brand of the car. However, taxis operate by a meter and are, in a general way, honest. You will have to pay an extra for the transport of the bags, so check it before you catch the Taxi. You can check this site for an approximate cost of your taxi ride. Schedule: 24 hours, every 15 minutes during peak hours and up to 30 minutes during non-peak hours (please confirm cost and schedule here). This is an option that can be very useful for those arriving after 11pm at the airport. As the last train from Changui is around 11.15 p.m. (confirm always) and the first one after 5:30 p.m., Bus 36 is even shorter. So, for those who arrive late at the airport, it is possible to take the taxi (more expensive) or to use the services of City Shuttle. 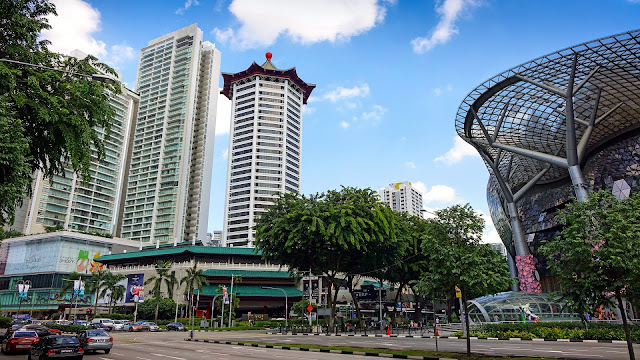 This is a service that distributes travelers through various hotels in downtown Singapore, so if your hotel is located in that area, this may be a good choice to consider, especially if you arrive late night when you only have a taxi as an alternative. The big problem with this option is that the distribution of passengers by different hotels can make the arrival at your destination very time consuming and also not the best way to travel for those who land with a lot of luggage. It is possible to make an advance reservation online for your transportation to the hotel here. If you don't make your reservation online, at the airport you should go to the Ground Transport Concierge at the Arrival Halls or make your reservation using the electronic kiosks available at the different terminals. You can pay with major credit cards and then just wait in the waiting area at your terminal. You can access more information on how to use this service here. We make reference to the duration of the trips but we always ask that you have this information as a possibility, since it can always vary depending on several factors, such as traffic, time of the trip, number of stops, etc. Also in relation to the amounts payable and the hours of operation of the different means of transportation, we always ask you to confirm on the companies websites, as there may be changes and our blog is not updated. If you discover any data that may not be up to date, we ask you to inform us through the comments box and we will try to update the information as soon as possible. We hope that our article will help you plan your trip to Singapore and if you still do not have a place to stay, we always do our reservations with booking, they are our partners and it's with them that we get the best deals. You can look for the best deals in your destiny by clicking here, it will not cost you any money and, it helps us to support our blog. Any question, leave your comment that we will be happy to help. You can also leave suggestions, comments, and do not forget to share on your social networks and see other Non Stop Family - Travel Blog articles.